It had been months since I wished to go to Kawah Putih (Kawah = crater and Putih = white), outside Bandung City (about 2-hr drive from Jakarta), West Java – Indonesia. 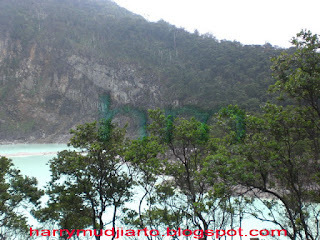 The wish has come true when my friends asked me to join them to Kawah Putih last weekend (28th April 2012). Started at 5 am in the morning, finally we were on our way to Kawah Putih with my friend’s car and continued to spend 1 night in Bandung City (Bandung). We departed at dawn to avoid hectic traffic on the way to Kawah Putih (the same direction to Bandung) through Cikampek and Cipularang highway. The trip took 4-hr drive from Grogol, West Jakarta – Indonesia smoothly with some traffic points before we entered the 1st (level) parking area of Kawah Putih complex. 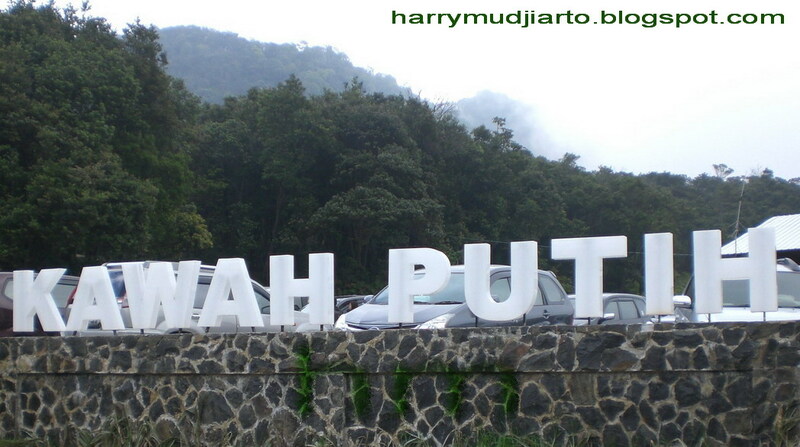 To reach Kawah Putih, you have to take KOPO Highway Gate (after Pasteur Highway Gate which is the way to Bandung), then turn right at 1st T-Junction then go straight follow the main street. 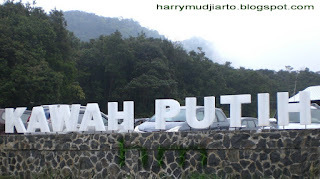 You will notice that there are hardly direction signboards to Kawah Putih, so GPS will be useful and please don’t get tired of asking the locals. We arrived on comfort weather which was 22º C in almost empty parking area even there were a couple of cars and buses already parked. The 1st level parking area surrounded by many of tents and café selling foods, beverages, snacks, fresh strawberry and many more. Many tents and café had just opened and we decided to get our late breakfast there before continuing the trip to Kawah Putih (about 100 meter from 2nd level parking area). After enjoying our quick breakfast, we started to go up to 2nd level parking area by so-called Ontang Anting vehicle instead of our car. Ontang-Anting is some kind like a modification car for 14 persons plus the driver which was the cheapest and interesting way to go up to 2nd level parking area. 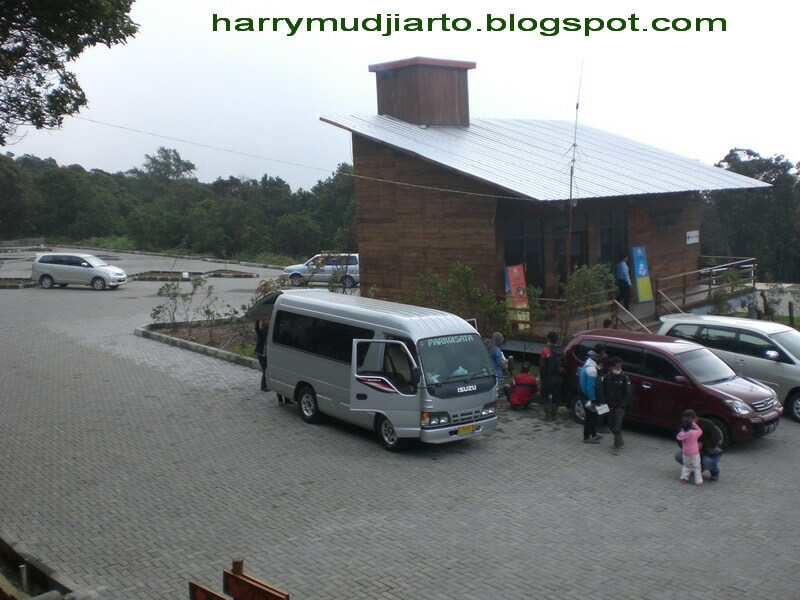 They only charged us Rp 10.000,- (return) each instead of Rp 150.000,- if we brought our car to 2nd level parking area. 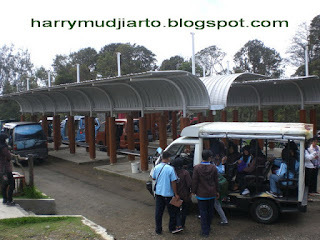 We had to pay for admission fee at Rp 15.000,- each before jumping in inside Ontang-Anting and began our 15-minute ride in a winding road, typical of a mountain’s road. 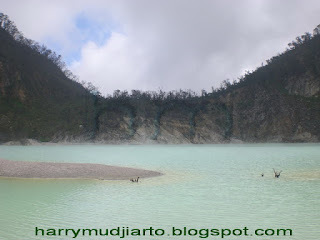 Kawah Putih is some kind like a small lake with high content of Sulfur. The lake has many different colors like (mostly) white, light blue, light green and other color in some occasions. The lake also has sulfur smoke, some thick and some not. When we arrived at the lake, we were lucky to find that it didn’t produce a thick sulfur smoke and we could breathe freely. The lake is relatively small but still beautiful, calm and mysteriously stunning. It’s a good place to take photography even with limited spot. Inside Kawah Putih area you will find a cave made by Dutch colonial which was forbidden to enter and there was so many wooden crosses in front the gate of the cave. Well actually there’s a signboard to warn us for not too long standing in front the cave without any explanation. So mysterious heh! 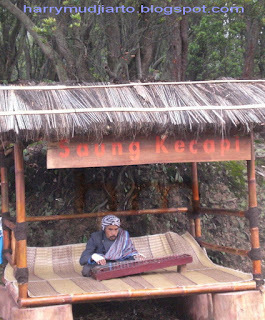 Still inside Kawah Putih entrance area, you will find a giant signboard telling about the history of Kawah Putih, beside a small gazebo with Sundanese harp player in it, playing Sundanese traditional music which was so beautiful and soothingly. It didn’t take a long time to finish our exploration in this small lake and we decided to go down to 1st level parking area and continued our trip to Bandung. Eat, drink and smoking are highly not recommended inside Kawah Putih for health purpose, thus there are no food/drinks/cigarette vendors inside Kawah Putih starting from 2nd level parking area. Back to 2nd level parking area, on the way to our car, we saw a bunch of fresh big red strawberry on sale. 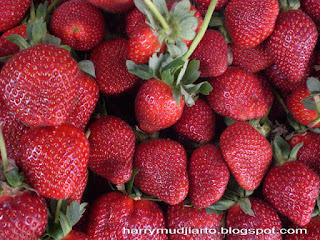 After a little of bargain, the deal price was Rp 30.000,- per kg and we started our strawberry party, four mouths for 1 kg of strawberry. The strawberries were big, juicy, red, taste mixed of sweet and sour, so yummy. Besides fresh strawberry, we also could find some jam, syrup, chips, jenang and many more, all made from Strawberry. Arrived in Bandung, we directly went to Cabe Rawit (restaurant), in 7 Teuku Umar Street (Dago Area) for lunch with their many special menu offers. This was not my first time lunch at Cabe Rawit, so of course I order my favorite menu in Cabe Rawit, called Nasi Timbel Cabe Rawit and Old Jersey for beverage. Nasi Timbel is steamed rice wrapped by banana leafs served with sour vegetables soup, traditional fried chicken, a chunk of fried anchovy, sambal, fried tofu, fried tempe (soya bean) and little bit of fresh salad. Old Jersey is a vegetables and lemon mixed juice. 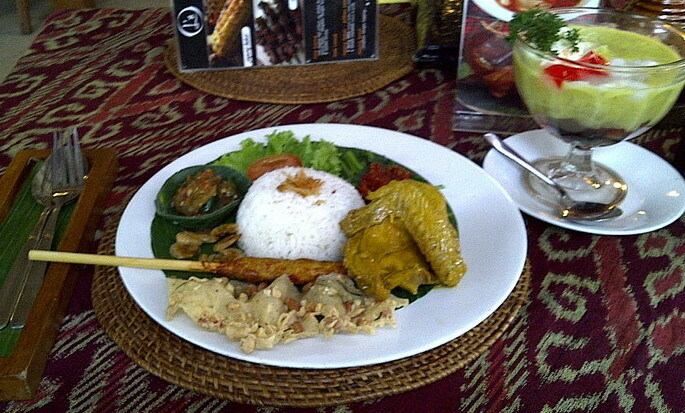 For sure, Cabe Rawit also offers many kind of Indonesian and International dishes. From Dago Intersection (to Dago), please go straight until 2nd T junction then turn right (nearby Up Town and Jetset Factory Outlet) and Cabe Rawit is on your right side. After lunch, we went to our hotel (nearby Cabe Rawit) and checked in for refreshment. 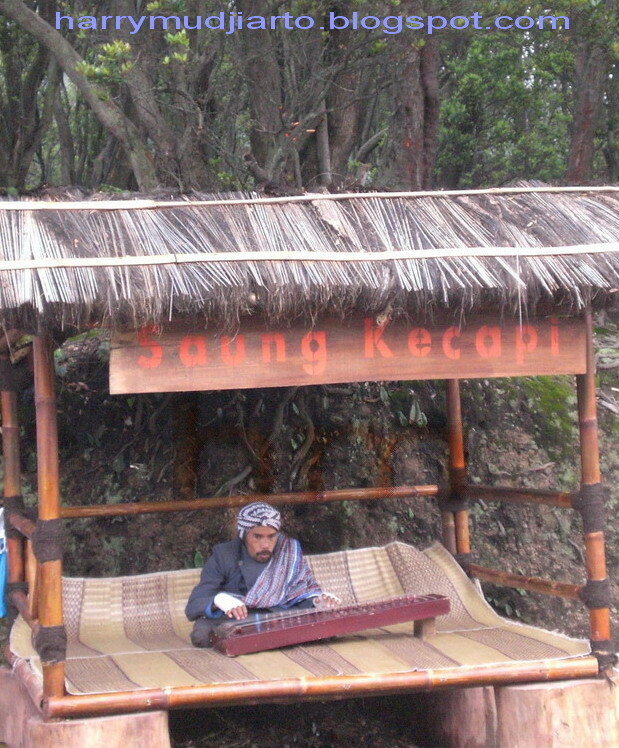 Reservation is highly recommended during weekend, long weekend and high season. At 5 pm we started to go to RE Martadinata Street called Riau (Factory Outlet area) for shopping from jacket to daily shirts. Personally, I prefer going shopping in the evening with limited time, but more comfortable because much less of shoppers inside the outlet than in the morning/afternoon which usually so crowded with thousands of shoppers in the outlets and on the street. After Riau and a quick glance in Ir H Juanda Street called Dago outlet area, we went to, Warung Ngebul ( 230 Ir H Juanda/Dago) which is still in Dago Street. 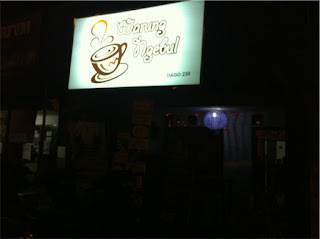 That was our first visit in Warung Ngebul which is open only from evening till midnight. In my opinion, Warung Ngebul is some ordinary resident house which has been renovated and adjusted to become a hang out place serving light meals. 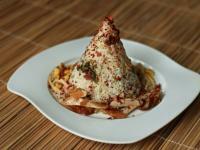 However, despite the menu being served in a small portion, it’s tasty and the place offers various of dishes and beverages, including desserts from authentic Indonesian to European like pasta. The price is so affordable and I can say it’s very cheap (average price is about ten thousands rupiah or so). My favorite dish so far is Nasi Tongset Ayam Suwir (baked rice with sprinkle of dry salty chili, chicken floss and chunks of omelet – notice: this dish is very hot) with Kurma Honey Ice Milk for the drink. My concern about this café was that it took quite some time for the crew to take our orders then serve them, but on the other side, the café provides many game tools like dakon (traditional local game), monopoly, cards and many more. From Dago Intersection (to Dago), please go straight until you find Mc Donalds fast food resto on your left side then take 1st U turn and Warung Ngebul will be on your right side before 1st T Junction. Please note that the café is so small and not so eye-catching from the street. After late dinner we decided to go back to the hotel, took some rest and by 10 am the next morning we already drove our car to Prima Rasa which is one of the best Brownies in Bandung. Prima Rasa also sells many others like cookies, traditional cakes and pastry, gelato, chips and many more. Prima Rasa is located at 20 Kemuning Street (Riau area). Prima Rasa is one of the favorite stores in Bandung, so you have to go there early to catch your favorite or their signature cakes before they’re sold out in minutes, like my favorite brownies with rum and raisin. Damn! Eventhough we arrived at 10.30 am, the brownies (rum and raisin) was sold out! lucky me there still was a lot of the stock of Apple Strudle which is very good taste. After got our things, we had to stand in a long line to cashier, damn again! Free off the hectic inside Prima Rasa, we stopped in Café Bali (215 RE Martadinata Street – Riau area) to have some lunch before going back to Jakarta. The name Bali in Café Bali doesn’t mean that they serve Bali Cuisine, well there was a couple of Bali Cuisine menu (like Chicken Betutu, Sate Lilit/fish, Plecing Kangkung) but overall the menu is dominated by western and Indonesian cuisines. The restaurant is splitted by two areas, one for ala carte and the other one for buffet. I ordered Nasi Bali, which is a steamed rice with Chicken Betutu (hot), Plecing Kangkung (hot), Sate Lilit, Peyek Kacang (flour and peanut chips), fresh very hot balacan sambal , and O Campur Bali for the beverage, which is jelly, pacar cina, fruit sweetmeat top with juice of avocado. 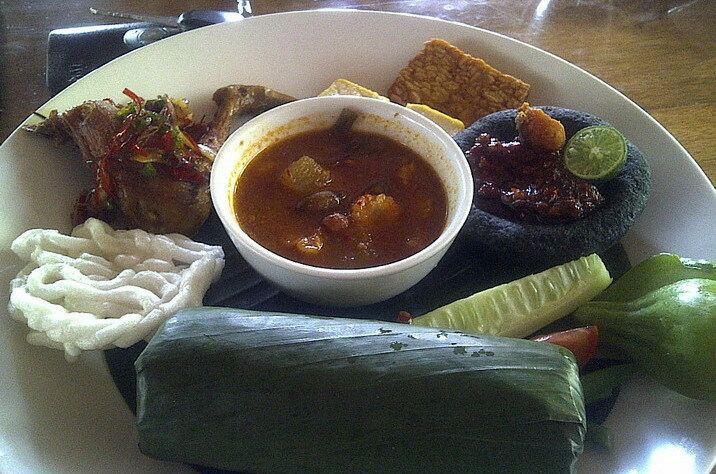 My highlight from my dishes was the fresh hot balacan sambal, it is to die for. From Cascade Factory Outlet (RE Martadinada Street) just go straight (to Gedung Sate direction). Café Bali will be on your right side. After lunch, on the way back to Jakarta, we spent our little time to stop by at Putri Sale Pisang, just about from Pasopati Flyover/bridge, before saying so long to Bandung, The Paris Van Java. Special thanks to Resviana for my English translation review. Thank u very much. it ws very informative, especially about kawah putih. if travel by private car how much it will cost?? well depend on your departure point, if you are from Jakarta, it will cost you less than IDR 300.000,- for gasoline and tol fee, but if you are from Bandung city, it will cost you less than IDR 150.000,- for gasoline and tol fee. 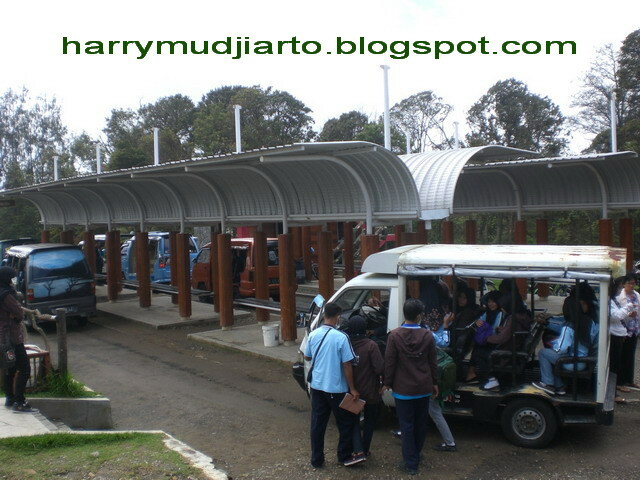 FYI, you can rent a daily car in Bandung city start from IDR 350.000,- (including driver and gasoline fee) for 12 hours.